As their name implies, red-backed salamanders are black salamanders which usually have a bright red stripe running down their back and tail. 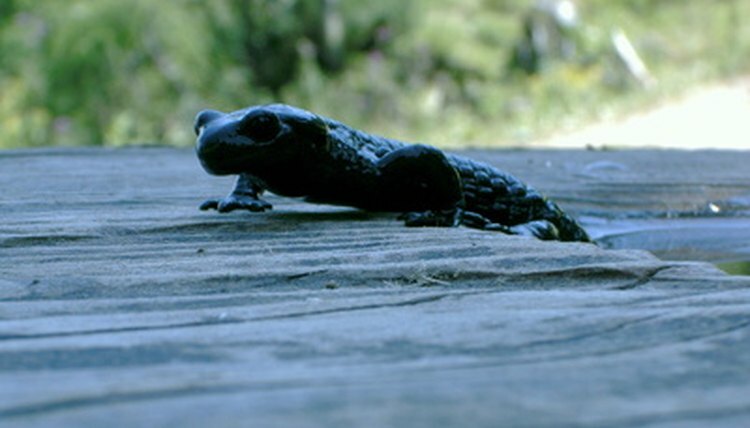 These salamanders are common in the United States, and are found in a woodland setting, usually near a stream or another body of water, although they are entirely non-aquatic, unlike most salamander species. These salamanders grow to a medium size of about 5 inches. Many salamander enthusiasts feel this particular type of salamander makes a good pet. Purchase a terrarium from a pet store. For every one to two salamanders you plan on keeping, you should have 10 gallons of terrarium space. Make sure the terrarium has an extremely secure lid, as salamanders are experts at escaping enclosures. Place the terrarium in a cool space that’s out of direct light. Fill the bottom of your terrarium with a layer of bedding. This bedding can be a layer of soil, coconut fiber, or moss. You can also purchase reptile specific soil at a pet store. The layer should be think enough that the salamanders can bury into it if they want to. Place plants in the terrarium. You can use live grass, live reptile appropriate plants from the pet store, or you can use fake terrarium plants, which are also available at pet stores. Place a water bowl in the terrarium. Only use filtered or bottled water for your salamander, as tap water can contain compounds that can damage the salamander’s health. Place wooden reptile structures, which are available at pet stores, in the terrarium. These should include structures your salamander can climb on and structures the salamander can hide under, such as a hollow log. Install a thermometer in the terrarium. Keep the temperature in the terrarium between 65 and 70 degrees Fahrenheit. During the winter, you should lower the temperature to 55 degrees Fahrenheit in order to approximate a natural winter. You can point air conditioners at the tank to cool it down if it gets too hot. Mist the terrarium with a spray bottle, concentrating on dampening the bedding. You should mist the bedding daily in order to ensure the proper amount of moisture and humidity in the terrarium. Again, only use filtered or bottled water. Feed your salamander small crickets or other small insects, such as small worms. You can feed your salamander a couple of insects a day. Don’t feed the salamander again until it has eaten the bugs you’ve already put in. Clean your salamander’s terrarium every second or third week. Be careful not to disturb the salamander when you clean.